Sabre Catamaran Beautiful Cat needs to be sold. Going to Auction! 'Nice Catch' has an open plan layout with plenty of space. 11.8 m long and 4m beam. Huge full width rear sports deck, and plenty of room to move ! It has a large saloon area with functional kitchen, large lounge and seperate dining table seating 6 adults on the surround seating. Both dining and lounge suit convert into comfortable double beds, which take minutes to convert to allow for an extended stay. Plasma screen tv and blue ray DVD player running off a 1500w 240v inverter. Also includes built in soundproofed cabinet outside for generator. Lots of 240v outlets, 12 volt and usb plugs throughout. Redarc battery management means you can maintain and monitor your batteries and solar via the digital screen, regardless if your on shore power or at sea. The rear deck is huge and extends out to a full width sports deck, with deckwash outlet, cold water outlet and gas bayonet for bbq. It has hot and cold water and a toilet and shower with handbasin and vanity cabinet in the bathroom. On the flybridge there is seating for 10 adults, a fold down table and full clears all round hanging from the full hardtop roof. Twin 700litre diesel tanks and twin 600 litre water tanks all below decks. It will do 20 knots and cruise economically at 15. This boat has just undergone a full refit in 2017. This has included the following. Full professional strip and blast and bare metal respray( Marine 2 pack system and Nyalic protection on the bare metal surfaces) Engines out and overhauled, blasted and new paint, both engines look and run like new. Legs off and overhauled. New engine gauges and switch panels from USA. (now fitted with canvas suncover) Current engine hour under 100 since overhaul. Full new electrics throughout, Redark BMS 30 and 200 watt solar. New start and house batteries, new 27 meg and uhf with AIS, am/fm radios up and downstairs, compas, Lowrance HDS 10 version 2 with navionics gold charts and 4G radar. Double din touch screen sound system downstairs, blue Led courtesy lights, new hella marine led floods outside (8 total). New switch panels and fuse panels all customised for the boat and installed both up and downstairs. New hydraulic steering, bilge pumps(5 total including water puppy), deckwash pump. New Savwinch 2000 anchor winch and 15 kg bruce. 8 man liferaft and the list goes on. 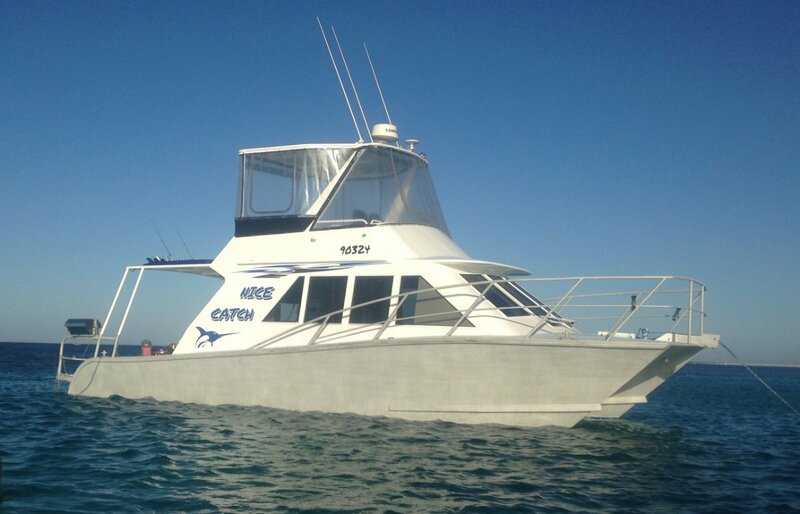 This boat is set up with the family in mind and trips to Rottnest but will lend itself well to a serious offshore fishing vessel and has space to add your own personal touches. Overall condition is excellent. Bottom paint and anodes redone april 2019. Safety gear, epirb, and lots of spares also will stay on board for the new owner. Auction in may 2019 by Smith and Broughton Perth. Keep watching for a link to the sale! Canvas dash cover for electronics, full clears. Hisense plasma TV. Pioneer blue ray DVD player. Jensen Touch screen multimedia system. Axis Bluetooth am/fm 4 speaker upstairs. 8 man liferaft, epirb, flares. Yes 4 auto plus water puppy plumbed to all compartments. Redarc BMS 30 battery management looking after house and starter batteries. 1500w inverter. Deck wash down pump. Savwinch 2000 anchorwinch. Shore/ships power switch, multiple 240v and 12 v outlets throughout. Lowrance HDS version 2.1 kw transducer, 4 G radar. Lowrance link 8 AIS VHF radio. GME G COM 27 meg radio. Plastimo led lit compas. Axis Bluetooth am/fm stareo. Stainless steel ships horns, long range marine aerials. GME tv receiver. Led Nav and decklights all round. 200 w solar. All newly installed 2017.